Especially in older buildings carbon steel pipes or galvanized steel pipes are used to distribute the drinking water. One problem about these materials is corrosion. For the user it gets visible as brown or rusty water at the faucet. Often this is the case, if no water has been drawn for a longer time. For example after the holidays or in holiday apartments after the winter. er taken after such a break gets clear after a few seconds, there is no need to worry. This brown water is caused by small corrosion spots, which occur while the water is stagnating. Loose rust particles are flushed out with the first use of the tap. This is not dangerous for your pipes or health and no further investment is needed. 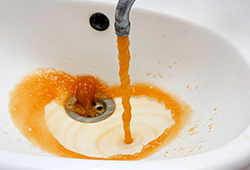 If the tap water is brown regularly (every morning), this could be an indicator for severe corrosion in the water system. In order to prevent your pipes from pitting corrosion and high renovation costs it can be worth investing in preventive measures like the Merus Ring. Depending on the type of corrosion, the corrosion rate can be reduced to a minimum, which means less rust in the pipe. No brown water from the faucet. In these cases, with small corrosion in the pipes, it is very easy (and impressive) to verify the success of the Merus Ring. In a normal family house, we install just one Merus Ring at the water inlet into the house. Either at the meter from the city water line or after the pump of the well. There is no plumbing required, as the Merus ring is installed just outside on the pipe. Direct after the installation we do flushing through the faucets. This is to remove as much as possible rust particles and sediments if any. 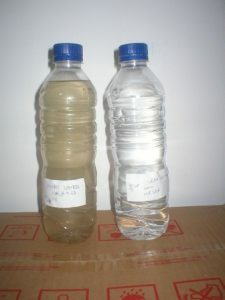 To verify the cleaning process, just take water samples into closed bottles as shown in the picture. Taking a sample of hot water and one of cold water, one can see, if both systems the hot water and the cold water have a problem. Often only the hot water has a problem. This may indicate that the cause of the corrosion is in the hot water boiler or in the water heater. Take these samples before and after the installation (at least two times) at the same tap and after similar standstill of the water. Please note that right after the installation the water will be even darker than before, as existing corrosion needs to be flushed out before there can be improvement. To support and speed up this process you can open the water supply fully often in the first days after the installation. Far easier for private homes is the method to just fill the sink with water (ideally a white sink) and see how the water clears up after the installation. In bigger and more complex applications (big apartment buildings, hotels, hospitals) we not only take water samples for you or support you with the visual inspection. We also analyse the iron content in the water. On average the corrosion rate can be reduced to less than 2 MPY and remains stable at this low level. In these cases the brown water will be gone in four to six weeks. There is no need to replace the pipes anymore which reduces effort and costs significantly.